We discovered a delicious little spot in Parkdale a few weekends ago, warm scones, perfectly steeped tea and truly unique and delicious confiture. The scone, jam and clotted cream combo brought me right back to England. 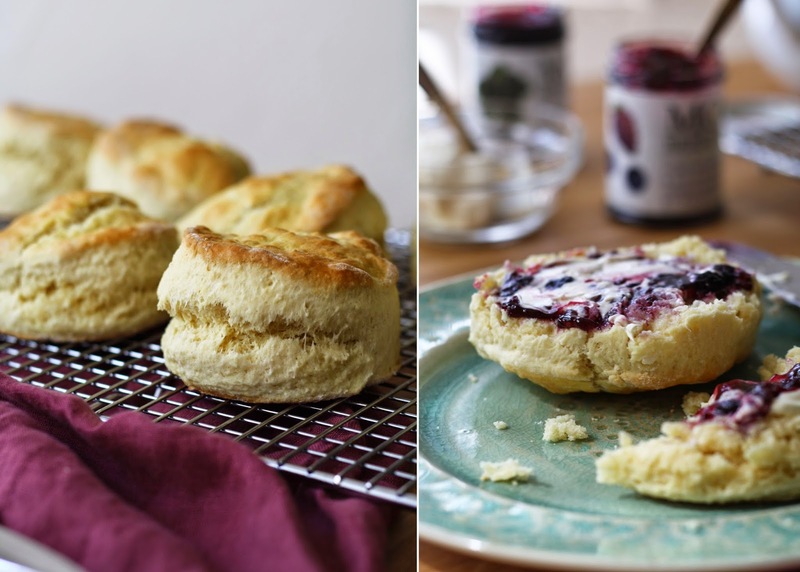 I woke up this past weekend totally craving a proper british scone (as opposed to typical American scones). A good friend recently bought us a subscription to Cook's Illustrated, and the first issue we received just happened to describe the perfect way to make British scones. This seemed like a great place to start. Dangerously delicious and more simple then you would think - these little guys are perfect for leisure weekend mornings, summertime park picnics, or afternoon tea. *note: if you forget to take the butter out early to soften, simply cut into cubes and pop in the microwave for 20 seconds. In a food processor fitted with the s-blade, combine flour, sugar, baking powder and salt. Pulse until combined - about 5 pulses. Add the butter and pulse until fully incorporated and mixture looks like very fine crumbs, about 20 pulses. Transfer to a large bowl and set aside. In a separate, smaller bowl, whisk the milk and eggs. Set aside 2 T of the milk mixture for later and pour the remainder into the flour mixture. Using a rubber spatula, gently fold everything together until fully combined. Transfer the dough to a well floured countertop and knead 25 to 30 times, until smooth and free of cracks. Keep your hands floured to avoid sticking. Press the dough down a bit to flatten, and use a rolling pin to roll flat, about 1" thick. Line a rimmed baking sheet with parchment paper. Using a 2-1/2" round cutter, cut as many rounds out as you can and gently transfer to the baking sheet. Keeping your counter floured, re-knead the dough, roll to 1" thick and cut out the additional rounds. Brush the tops with the milk/egg mixture. Lower the oven temperature to 425 and bake scones for 10-12 minutes, rotating the sheet at 5 minutes. You'll know they are ready when they have risen and are golden brown. Transfer to a wire rack and cool for 10 minutes before serving. Best served warm, with clotted cream and jam.